Modular office rooms provide an aesthetically pleasing work environment conducive to production. They are easy to install and provide employees with an office space that promoting privacy for the employees and the added benefit of an efficient use of office space for the employer. Modular office rooms provide a durable and lasting office space environment in any type of building, whether an office space or an in-plant operation headquarters. Modular office walls come in a variety of options as far as material and appearance. Choose from prefabricated standard and customized wall sizes. Modular office rooms are designed and fabricated to be fireproof, sound proof and cost effective. Modular office walls are manufactured with the plan of being simple to assemble in mind. Their construction is lightweight for ease of maneuvering and assembly. The walls are designed with a honeycomb interior equipped with raceways for the simplicity of installation for wires for phone, data, and electricity. Walls are prefabricated in a standard size of 8’ x 10’. However, walls are also available for any customer designed requirement. This provides the customer with the option of designing their own size and style of modular office rooms. With the standard size walls as well as custom wall sizes, assembly is quick and easy. Insulated windowed walls provide light and viewing options. Assembling modular office rooms comes without the need for measuring and cutting materials on site. 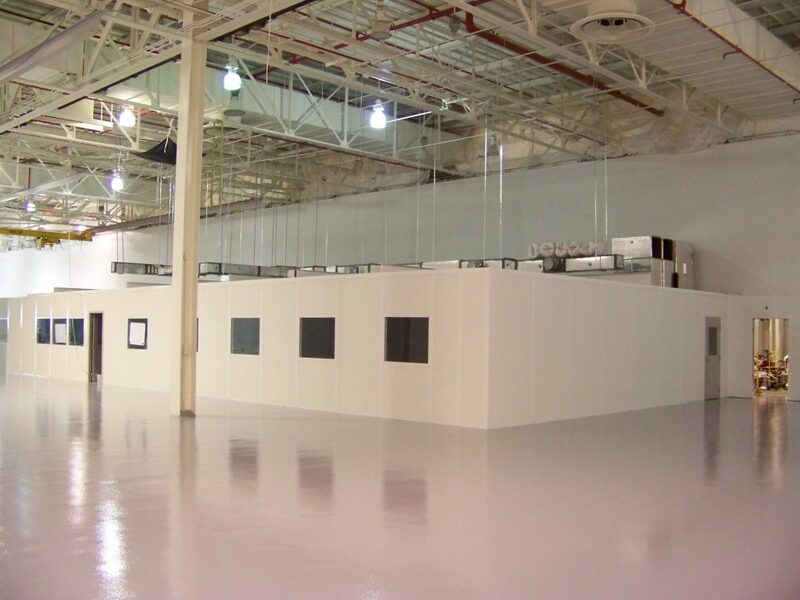 Materials needed are fabricated and shipped to the location for a professional crew to install the room in a minimal amount of time. Because the materials are constructed with ease of installation in mind, the lead time for building a modular office is significantly shorter than that of stick and drywall construction. Prefabricated walls, doors, and windows offer the added benefit of less wasted materials and trash at the end of the construction project. When it comes time to expand the workspace, modular office rooms offer yet another construction benefit. Walls and levels can be added without the need for demolition that would be required with stick and drywall structures. Again, this way of building cuts down on time, waste, trash, dust, and cost. New walls can be abutted to the existing structure with little downtime. A wall section is removed and replaced with a door section to allow access to the new space. While prefabricated modular walls are a standard size of 8’ x 10’, customization is always an option. Tall walls are an alternative to combining multiple wall sections for a higher room. These tall walls also offer the benefit of stability and ease of running electrical, phone, and data lines that combining multiple walls cannot offer. Custom tall walls are available in whatever size fits the needs of the customers. Tall walls offer a seamless look that requires no horizontal posts for assembly. Modular office rooms constructed with tall walls are easy to assemble and provide the added convenience of mobility that is found in all modular office rooms built with prefabricated or custom fabricated walls. A mullion bar is unnecessary for construction of tall wall rooms. 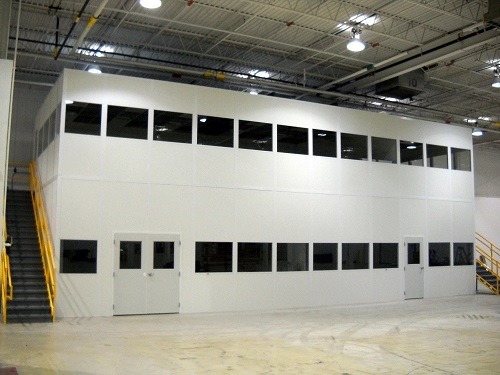 Modular office walls are designed to meet or exceed most building code requirements. All of the materials used are to conform to most code requirements, which helps to reduce the amount of time needed to apply for permits and wait for inspectors to approve construction. In some cases, if modular office rooms are designed to be constructed inside of a warehouse, they can be considered equipment, thus no permit or inspection is necessary. If inspections are required, they are of a different sort than inspections required of stick and drywall construction because of the fact that the prefabricated walls are designed to meet or exceed most building codes. Options for construction material include those that have a one-hour fire resistant panel system, which is ASTM approved. Other options are available for fire safety. Modular office rooms are designed with the needs of the customer in mind. The prefabricated and custom designed walls are available in a variety of colors that suit the décor of any building. The material of a prefabricated wall is up to the customer; materials like steel, hardboard, fiberglass reinforced plastic, plywood, or aluminum are available as materials that can be laminated. The most commonly used material for modular walls is vinyl covered drywall at ½”. Contact us for all style and construction options to meet your specific needs.